The Great River Bridge, a $750 million proposed crossing on the Mississippi River near Arkansas City. It is part of future Interstate 69. It has been designed, but no funding for the bridge has been identified. It should be a very long time before any construction will begin on this bridge; I've started this thread to basically be a repository of information of the occasional snippets of information about cost estimates and other related items. Over time, it should be somewhat similar to the "I-69 Ohio River Bridge" thread on the Ohio Valley page. At any rate, construction of both the I-69 Mississippi River Bridge and the I-69 Ohio River Bridge should give us a new take on the "race of the turtles". The Interstate 69 bridge’s close proximity to the new U.S. 82 bridge and its price tag — $715 million — raises a question: Why spend money on a new I-69 bridge at Benoit when there is now a completed interstate-grade bridge near Greenville? Many years ago, Charles W. Dean (now deceased) proposed a combination road/rail bridge across the Mississippi River near the Bolivar County town of Rosedale, where a port had just been opened. The I-69 bridge, if built, would cross the river near the town of Benoit, about 12 miles south of Rosedale. A railroad component would be out of the question, since there is no rail service in Bolivar County anymore, a source of grief for this train lover! I dont believe either project is going to make FY 2010. Not surprising, since Arkansas has many more pressing needs. Bryant stressed the importance of railroad transportation in the Delta to the crowd. He said he has asked the Mississippi Development Authority to work with railroad users, Mississippi Department of Transportation, the Delta Council, the Wyoming Rail Company and other industries all along the closed rail lines between Greenwood and West Point. "This is with the interest of reaching the river ports of Greenville and Rosedale. To reopen this 92 mile abandoned stretch of rail will require significant investment," he said. "So I've asked the MDA to proceed with a sense of urgency in identifying opportunities to support reopening this east-west rail corridor to provide rail users on the east side of the state access to these ports on the Miss. river." I think that there would be pleeeeenty of time to re-design the I-69 bridge if the return of rail service proves to be successful. It would seem to me that one of the Class I railroads would jump all over the idea of a MS river bridge since it would increase inter-connectivity and since there are no rail bridges on the MS river between Memphis and Vicksburg. However, the article doesn't mention a rail component for the bridge, but instead just for repairing and reopening the stretch of the old Columbus and Greenville railway. I would hope that a river bridge would be considered. It would seem to me that one of the Class I railroads would jump all over the idea of a MS river bridge since it would increase inter-connectivity and since there are no rail bridges on the MS river between Memphis and Vicksburg. Railroads like to have a small number of major hubs for efficiency. Except for a unit train (e.g. coal to a power plant) it's not a good idea to bypass those hubs. This is why the Toledo, Peoria and Western Railway never took off as a Chicago bypass. The Great River Bridge is also known as the Charles W. Dean Bridge. I-69 SIU 12 includes the Charles W. Dean Bridge over the Mississippi River and a short approach from Mississippi. Here's a map of SIU 12 (which is located primarily in Arkansas). Arkansas 2010-13 STIP, which was released in April, lists a FY 2010 letting for the Charles W. Dean Memorial Bridge over Mississippi River for "Phase I". The project has an earmark of $8.67 million and the total letting is anticipated to be $10.35 million. It's no great surprise, but no projects for the I-69 Mississippi River Bridge are included in the Preliminary 2013-16 STIP, and it appears to be on hold at least through 2016. The only I-69 project listed in the Preliminary STIP is for the Monticello Bypass; no SIU 12 projects approaching the bridge are included. The TIGER II grant application for restoration of C&G RY service included a mention of its being a component of a transcontinental network if rail were added to the Charles Dean bridge. They also brought out the homeland security aspect of having a RR bridge in place if one or more of the Memphis or Vicksburg bridges were knocked out of service for any reason. The less than twenty miles of new railroad track that would be required is certainly a lot less than the new terrain I-69 mileage needed in both Mississippi and Arkansas! They also brought out the homeland security aspect of having a RR bridge in place if one or more of the Memphis or Vicksburg bridges were knocked out of service for any reason. The thought of al-Qaeda leaders cackling and saying "Yes, our next plan is to blow up a railroad bridge in Mississippi! That'll fix 'em!" is in no way plausible. Sounds like whoever wants this project done is just bullshitting to make the project more appealing. I wonder how the east end would play out? Norfolk Southern used to have a line from Columbus east to Birmingham via Fayette and Parrish, but parts of that line were abandoned in the late 1990's. The western portion of it operates as a short-line railroad. There is also the former KCS line (now Alabama Southern) going out of Columbus east to Tuscaloosa which interchanges with NS in Tuscaloosa and CSX in Brookwood. It's not so much al-Qaeda that concerns some people, but the flow of freight through this region. Should a barge break loose & wipe out the bridge @ Vicksburg (which happens to be the only rail crossing the big muddy between Memphis & Baton Rouge! ), or old age catches up with any of the bridges, it would keep congestion down in Memphis or BR should they have to close the Vicksburg bridge. I, also being a railfan & rail employee, would love to see some abandoned rail R.O.W. come back to life. To reopen this 92 mile abandoned stretch of rail will require significant investment," he said. "So I've asked the MDA to proceed with a sense of urgency in identifying opportunities to support reopening this east-west rail corridor to provide rail users on the east side of the state access to these ports on the Miss. river." ... the completion of I-69 Charles W. Dean Bridge can significantly impact the railroad freight flow in the United States. The Columbus & Greenville Railway can connect to Union Pacific Railroad at McGehee, Arkansas, to the west with less than 20 miles of new railroad track. Earlier this month, the Arkansas Economic Development Commission hosted a workshop to address rail access in the state with economic developers in the state. McDaniel said there were several items addressed at the workshop, and there will be more like it in the future as the state and the nation shift back to using railway more to ship more goods cross country in an effort to sayve money. Of the items discussed, McDaniel said she was glad to see rail banking addressed because not too long ago there was a movement pushing to pull up the railway instead of preserving it for the future. “Shipping by truck is so expensive these days that businesses and industries are going back to the rail,” McDaniel said. Another issue discussed at the workshop was the federal government’s requirement for the state to include a rail plan in the state’s transpiration [sic] plan. The mandate will be that each state much create a plan to improve rail transportation for both freight and passenger train. “Rail is very important to what we trying to do,” Lipton said. The entire concept behind the intermodal facility brings rail, highway transportation and the use of the Mississippi River together to get items shipped from one place to another. “We expect the Mississippi River to be used to ship items north once the Panama Canal opens to larger ships,” Lipton said. If there is actually a trend back to rail for cross-country freight transportation, then adding a rail component to the I-69 Charles W. Dean Bridge might make increasing sense. Is this bridge going to be a drawbridge? In the February 13, 2012 article, Some imagine Chester Street for new bridge, Scott Bennett, the director of the Arkansas Highway and Transportation Department, gave a current estimate of $750 million for construction of the Great River Bridge .... The Great River Bridge is also known as the Charles W. Dean Bridge. ... it appears that significant Federal assistance will be required to advance development of the I‐69 corridor, particularly given the high cost of the bridges across the Ohio and Mississippi Rivers that are keys to ensuring connectivity throughout the corridor. This report identifies several FHWA funding programs that could potentially be used to support development of the corridor. Section 1116 of MAP‐21 includes provisions for development of a freight plan .... the Secretary may increase the Federal share payable for any project to 95 percent for projects on the Interstate System and 90 percent for any other project if the Secretary certifies that the project meets the requirements of this section .... The potential for increased Federal participation could be beneficial for all I‐69 segments, but particularly bridge segments that are high cost and for which funding for the entire segment must be available before any construction can be initiated ... the states should coordinate with FHWA to ensure that I‐69 is included in the Freight Plan to better position themselves for a reduced State match under MAP‐21 and future funding programs. The report must include a comprehensive list of each project of national and regional significance that has been compiled through a survey of State DOTs .... to improve the opportunity for Federal funding of I‐69 segments under both the current and future versions of this program, each state represented in this study should contact FHWA to ensure that they are involved in the process and provide the documentation necessary to support FHWA’s determination that I‐69 warrants a position on the list based on the requirements identified above. If federal money does become available in the future, at least this project is "shovel ready". Railroads like to have a small number of major hubs for efficiency. Except for a unit train (e.g. coal to a power plant) it's not a good idea to bypass those hubs. The Final Findings do not discuss the possibility of adding a rail component to the bridge. Revised post to include links to the Final Findings and the Executive Summary. 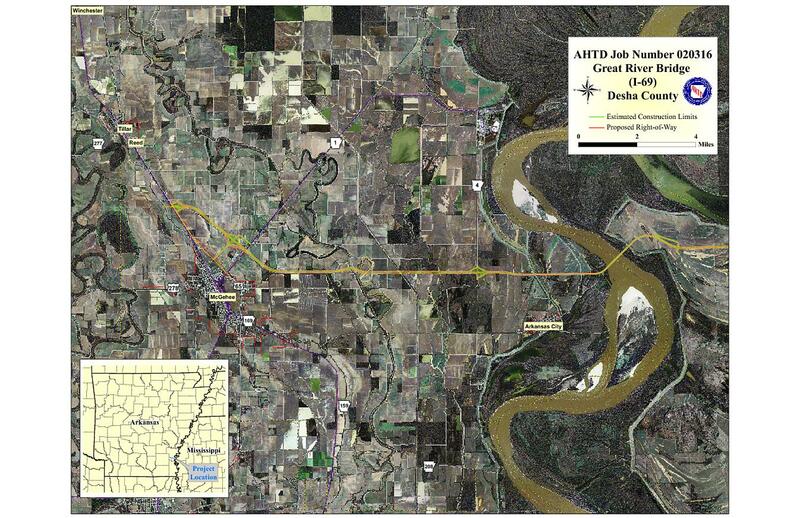 "It is also suggested that AHTD and MDOT coordinate with FHWA to designate I-69 (including the Mississippi River Bridge) as a Project of National and Regional Significance:"
Be interesting if they will then apply for TIGER IV (TIGER 2013) funding. NCDOT made the case that the new I-85 bridge was of national and regional importance (including renaming the bridge) in order to get some TIGER funds for its eventual and current construction. Atkins North America has completed its I-69 Innovative Financing Study Final Findings and the Executive Summary. In the Final Findings, it is noted that the I-69 Mississippi River Bridge is essentially ready to begin construction once funding for it is identified (page 9/122 of pdf; page 4 of document) .... In order to best position I-69 (including the Mississippi River Bridge) for future federal funding the Final Findings suggest that the project should be included in the respective freight plans of Arkansas and Mississippi (page 18/122 of pdf; page 13 of document) .... The Final Findings also suggest that AHTD and MDOT coordinate with FHWA to designate I-69 (including the Mississippi River Bridge) as a Project of National and Regional Significance (pp. 17-18 of pdf; pp. 12-13 of document) .... If federal money does become available in the future, at least this project is "shovel ready". AHTD has posted the PowerPoint presentation for the May 21 Southeast Arkansas Cornerstone Coalition banquet. It was merely a reminder that it’s planned for the future and we needs lots of money to make it happen. No announcement of a TIGER funding request. 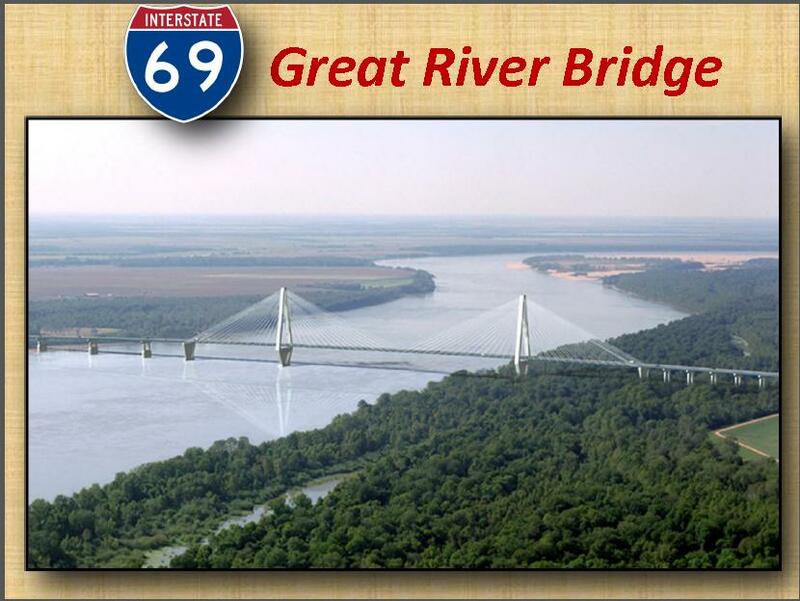 As a minor point, the slide demonstrates that AHTD refers to the bridge as the I-69 Great River Bridge instead of as the Charles W. Dean Bridge. He said he has asked the Mississippi Development Authority to work with ... the Delta Council ... and other industries all along the closed rail lines between Greenwood and West Point. the completion of I-69 Charles W. Dean Bridge can significantly impact the railroad freight flow in the United States. The Columbus & Greenville Railway can connect to Union Pacific Railroad at McGehee, Arkansas, to the west with less than 20 miles of new railroad track. Efforts to enhance road transportation have proven more successful than bids to fill gaps in rail systems. The Delta Council successfully lobbied, with others, to secure financing to complete the Interstate 269 Memphis, Tenn., bypass, which, when completed, will tie into several major highways leading north out of Mississippi: Interstate 55 and U.S. highways 61 and 78, the latter of which is expected to be completed into Birmingham, Ala., in late 2014, when it will be designated Interstate 22. The council, however, remains concerned about legislative failures to secure future funds to maintain roadways. the Delta Council is working to restore “broken links” in rail transport between Greenville and West Point. As with the remainder of I-69 in Mississippi, there is no express mention of the I-69 Mississippi River Bridge in the article, but there is still a possibility that a rail component could later come into play. We received a request for the following subject documents and thought we'd share with everyone. I believe these "broken rail links" mentioned is the former Columbus & Greenville Railroad (CAGY) IIRC. I have a friend who used to run trains between West Point & Greenville. He told me there used to be lots of pulpwood yards between these towns, but the railroad insisted on more money to haul it. That turned the woodyards to using trucks, so the CAGY shut their western end down. Norfolk Southern used to have a line between Birmingham and Columbus, MS which fed into the CAGY. A portion of this line between Berry, AL and Belk, AL was abandoned in the mid 1990's. A cotton mill in Fayette, AL was served by this line, along with various lumber yards west of there. The portion of the line between Belk and Columbus is now a short line railroad called the Luxapalila Valley Railroad. If NS would have kept the line and invested in keeping up the CAGY, then perhaps we could be talking about a rail bridge over the Mississippi River to connect to the UPRR, perhaps as part of the I-69 crossing, but now none of it seems likely. I believe at one time when the CAGY was built a MS River bridge was considered but never happened. AHTD, thank you for posting the FEIS and ROD. Great historical info! The rail component did not survive the I-69 bridge FEIS and ROD (I think). Given that approximately ten years have passed since the FEIS for the I-69 bridge was completed and Mississippi is making (distant) noises about reviving the C & G, has there been any interest from Arkansas (AHTD and/or Union Pacific) and/or communication with MDOT to revisit the possibility of having a rail component on the bridge? Also, will you please post the initial GRB EIS that includes the rail component? http://www.arkansashighways.com/forums/GRB_Prelim.pdf This is the earliest report we located. Also, found another FEIS that was completed for the GRB in 2000 (39MB).